Northern Lights Solar Solutions is offering its dealers an easy to use and precise solar heating simulation software tool that supports them in their daily planning a sales process of their solar hot water heating solutions. “Thanks to the combined development of the customized Polysun Simulation Software, Northern Lights Solar Systems offers now customized planning solar hot water heating systems, completing it’s Plug’n Play product range” commented Director of Solar thermal Dan Jung. Polysun simulation solar heating software brings precision in calculating and in designing solar heating installations by providing detailed and analytical project results. Polysun’s Northern Lights version contains a selection of solar hot water heating schemes that can be adapted according to the customers’ needs. The simulation will lead to a detailed series of performance results and forecasts. “Polysun is proud to announce its first partnership in Canada in collaboration with Northern Lights solar solutions”, states Simon Geisshuesler, CMO, head of sales and marketing at Vela Solaris. “The partnership with Northern Lights is an excellent opportunity to provide their dealers with an easy to use and precise tool to sell solar systems”. Northern Lights Solar Solutions is a world leader in alternative energy sources specializing in solar heating systems. Northern Lights Solar Systems provides complete turnkey solar heating system for Do-It-Yourself Solar Installation. These kits contain everything the customer needs for its project. Best of all NO Plumbing is needed and NO Electricial hook up. Everything arrives including fittings, collectors, tanks, and our special Easy-Flex solar piping for quick connections. With the new solar heating simulation software jointly developed with Polysun, Northern Lights Solar Solutions provides new customized planning and design of its solar hot water heating systems. 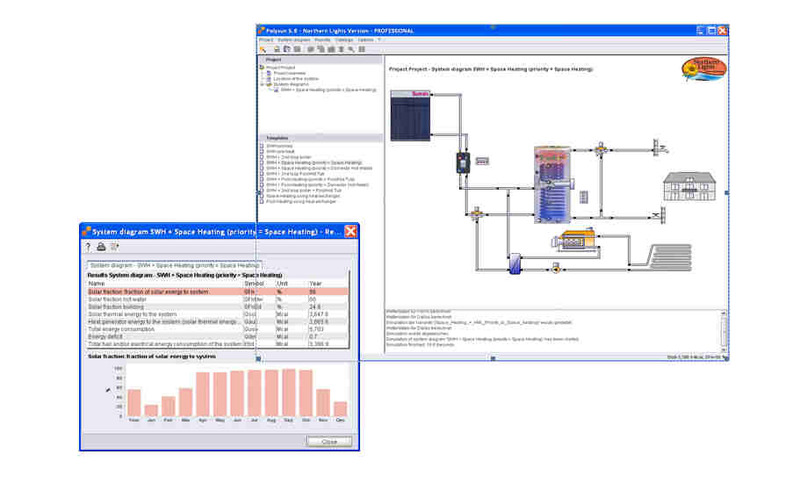 Vela Solaris is a leading provider of simulation software for the renewable energy sector. Polysun, simulation software developed by Vela Solaris, provides invaluable support in the analysis, design and calculation of heating and cooling systems using renewable energy. Polysun has been specifically created for solar thermal energy, photovoltaics, heat pumps, geothermal energy and solar cooling. The Vela Solaris’ product range incorporates extensive research activities in cooperation with universities and the industry as well as providing the opportunity to customize the software (company versions as stand-alone or online versions).